And its a BOY! Our new addition to the family is very cute and has currently taken residence of the lounge room! 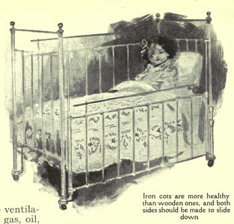 “Iron cots are more healthy than wooden ones, and both sides should be made to slide down.” Source: Every Woman’s Encyclopeadia, Vol I. To celebrate this occasion, I wanted to share with you some advice given to mothers upon the birth of their babies, published in Every Woman’s Encyclopaedia (1910). Firstly, the high rate of infant mortality (statistics of one in five is stated in this article) was considered quite costly to the English nation. And 75% of these deaths were attributed (by the author of this article) to the early introduction of “harmful foods”. In these days, cows milk was not routinely pasteurised and so was considered problematic for a baby’s consumption, especially when it could not be obtained fresh from a cow. As a result, the writer recommends exclusive breastfeeding as best for the baby. Every mother, then, who can nurse her baby should make it her duty, as well as her pleasure to do so, and provided she is reasonably healthy, looks after herself properly, and feeds the baby at regular intervals, there is no reason why her milk should not amply suffice. It is a well-known fact that breast-fed babies vary rarely suffer from rickets, diarrhoea, convulsions, or any of the troubles which beset the baby brought up by hand [hand/bottle feeding rather than breast feeding]. And after giving a description on how to tell if a baby is thriving on breast milk, the author goes on to give advice to the nursing mother. …the nursing mother must be very careful of herself for the baby’s sake. She should eat good, plain food, with milk and cocoa, or good oatmeal gruel, avoiding too much tea, and unless ordered by the doctor, all alcoholic drinks. She must avoid hot places of amusement, late hours, and worry or excitement. Thereafter comes some advice for mothers who cannot nurse their baby, for whatever reason. Cow’s milk must be modified to suit the baby’s digestive system better. It should be sterilised and pasteurised if it cannot be got fresh. It then needs to be diluted with barley-water, fresh cream added, and sugar of milk added. Just reading the rigmarole of cow’s milk modification makes me grateful for the invention of formula! One sees how Every Woman’s Encyclopaedia was probably an invaluable source of information to the women of this era. Its advice is fairly sensible, especially when compared to much of the other types of advice given to women throughout history, and the publication covers a wide range of issues and topics that the Edwardian housewife would encounter. Every Woman’s Encyclopaedia, Vol. I, p. 181. My blog has been a bit quiet of late, largely due to the expectation of another “bundle of joy” arriving in our family. In the flurry of this organisation – and then the inevitable rest that results when a pregnant woman has been too busy organising things – a lot of my sewing and reading projects have been put on hold. In expectation of this event, I wanted to share with you some advice given to expectant mothers in 1910, in Every Woman’s Encyclopaedia. This publication was generally full of a great range of (usually) sensible advice and information for the Edwardian woman, but this article in particular amused me! “A nursery frieze that would delight children.” Source: Every Woman’s Encyclopaedia, Vol I. In ‘Preparing for Baby’, the midwife begins by stating that “as soon as a woman knows that she is likely to become a mother, it should be her sweet duty to order her life that her child may be born strong, healthy and beautiful.” She goes on to advise on “the essentials which should receive attention” – that is, food, clothing, exercise, fresh air, rest, sleep and “good surroundings”. Here are several of her recommendations. The wise woman will put aside her fancies and eat only such foods as will be most beneficial to herself and her unborn child. Wholesome, plain, nourishing food should be taken, little meat being required. Indeed, some authorities recommend a diet chiefly of fruit and vegetables, with plenty of wholemeal bread. Knowing the terrible trouble I have with anaemia during pregnancy, I am surprised at advice on limiting meat in the diet! She also recommends limits on tea and coffee, as well as alcohol and other stimulants, which falls more within the bounds of normality. Clothing should, of course, be warm but light, and should not be suspended from the waist, and there should be no pressure on any part of the body. Corsets must be dispensed with, as they cause harmful pressure on the heart and stomach. Only 20 years previously, in the late Victorian era, pregnant women wore a maternity corset which contained lacing to accommodate the enlarging abdomen. The Edwardian corset, by contrast, extended well down over the hips. For house wear a pretty maternity dress or princess robe, made in tea-gown style, is becoming and easily made at home. Garters, which are never advisable, must not be worn, as they increase the tendency to varicose veins. It is a great mistake to suppose that the expectant mother cannot take exercise to do her ordinary household work. She should however, avoid such work as entails lifting the arms high above the head, lifting heavy weights, climbing stairs or standing too long. I might avoid sharing that piece of insight regarding housework with my husband! If the weather be unsuitable [for getting outside to breathe fresh air] (for great care must be taken not to contract internal chill), the house must be flushed with fresh air, especially the bedroom and living room, which should be as bright and sunny as possible. I am not sure that my children fit into that category! Avoid undue excitement, such as crowds or theatre-going. And I had been thinking of getting to the movies this weekend! After giving advice on how to engage a doctor, nurse and midwife, the author gives prescriptions for preparing the labour room with all the essentials, including the baby’s clothing and articles for the mother. After the first few days following the arrival of baby, the young mother should be encouraged to think of this time as one of great happiness, rest and contentment – cheerfulness is a great restorer. Yes, well, the first few days are usually manageable… it is the months of sleep deprivation that follow that is the killer! However, I am sure that cheerful thoughts can often play their part. Every Woman’s Encyclopaedia, Vol. I, p. 30.